Thanks! Agreed. For fun and experience. I think I remember the Danish race is where there is a bunch sprint every few laps and if you win you’re out and that’s your place starting from first place until top 5 is set. Dutch or Belgian is opposite, you win an early sprint you get a worse finish. But if you wait till end you may not plce at all. Thanks - sounds like the "Win and Out" races we have at my local track. Yup. The first one sounds like a "Win and Out" where after a set number of laps, there are 3 sprints in a row for 1st, then 2nd, then 3rd places (where the winner of each lap wins that position then safely exits the track), then one more final lap for the final placements. The race is a big gamble. You don't want to burn a match and lose the sprint because that could effectively takes you out of the subsequent sprints. Many newbies simply burn all matches on the first bell, lose, and are a wreck afterwards for the rest of the race. Last edited by carleton; 02-16-18 at 06:59 PM. 3T made the Mistrals to be a low stack bar (due to an "outcry" at the time that all their other bars had very high stack) and while parts of them (the pad position) are very adjustable, pretty much everything else is not adjustable, particularly stack. First a caution... DO NOT add spacers BELOW the base bar. The Mistrals are not designed for that. So your choices with what you have right now are limited to basically adding spacers between the pads and the base bar (I've done this for athletes in the past on this bar so it will work) OR buying additional hardware. THIS specifically is what you need. (conveniently out of stock) but you could also use any of the mounting brackets cannibalized off of a Brezza/Aura bar. With those brackets, the extensions AND the pads mount above the bar (like the picture I posted above) - if you do this you do lose the adjustability of moving the pads as far out as you'd (possibly) like. Well, it's probably all irrelevant for me now, as of a few hours ago. I had my stem dropped all the way down, all spacers removed. The reason why I wanted to be able to stack the pads or pursuit bars higher was I thought maybe the drop would be too aggressive, but it turns out it is perfect. I have very flexible hamstrings and hip flexors so I'm very comfortable with an aggressive aero position on the bike, with no loss of power. My only reason for getting some new bars now is to get a better set of pads that are not so flat, but are more curved and arm hugging....not a major deal for me now. Carleton, I will share my experience. In my first races on the track back in the early 90s I got to watch several riders flat clinchers and immediately roll the tires off causing major incidents. Seeing that will make you swear them off. A couple of years ago I built a set of clincher training wheels and had some unsettling experiences with them. When I would turn hard on the track it would feel like the tire was rolling off the rim. I switched back to tubulars and haven't looked back. The above said I am larger than the normal track racer, and I tend to be hard on equipment. I have seen plenty of people ride/race on clinchers with no issues, but my initial experiences of having to dodge riders who crashed due to tires rolling off of clincher rims I won't ride them on the track. Could it be that tire and/or rim manufacturing techniques and tolerances are better? I recall being able to mount a new Conti tire with only hands in the 90s and early 2000s. But in the past 10 years or more, I have to fight to get them on even using shop quality tire levers. Cursing. Once I got so pissed I took it to a local bike shop and had absolutely no shame at all paying another man to mount a tire for me. Most recently, it took me over 30 minutes to mount the two Vittoria tires on my training wheels a couple of months ago. Hands were sore afterwards. I feel you there. I've driven begrudgingly to the repair shop before to have this done, and to my embarrassment had to watch a young kid mount the tire in 30 seconds. :-) Must be an art form. I had to start wearing leather gloves for this same reason. I was tearing the crap out of my hands trying to get the last 6 inches of the tire over the rim. Have you tried using a blow dryer to heat the tire up so it stretches easier? I've heard of guys setting their tires on those old fashioned radiators for a while before mounting. Don't tell my wife, but I put new Vittoria Corsa Speed TLR clinchers in the clothes dryer for several minutes to warm them up before mounting. These tires are tubeless ready (but I run latex tubes) and are particularly tough to get on. Even warmed up, I need one of these to get them on. Don’t even talk to me about tubeless Vittoria Speed’s, I’ve been racing on the road on them for a year now. Absolutely awesome tyres, stupidly fast and they feel amazing but damn, getting them mounted on my wheels was a complete nightmare. I’m still a full noob on the track but running the new Vittoria Pista clinchers, they feel good. Weirdly I did have an inner tube blow for no apaparent reason in the car which popped the bead off the first time I used ‘em. Unnerved me a good bit but haven’t had a problem since, the tube had been sat for a long time wrapped in an old coffee bag strapped to my training bike though! If I eventually buy something nice and aero for the front of the bike it’ll probably just be a Clincher as dealing with tubs is crap, I’d never run tubeless on the track though. Last edited by Monkeyfudger; 02-17-18 at 04:28 AM. Noobie here as well, coming from the Time Trial and Road world. It's weird how some wheels/tire combination are such a ***** and it doesn't appear to be correlated to wheel/tire width. I have the 60mm Rovals on my Venge and use Conti Grand Prix II 23mms, and I can put those things on in my sleep with no tools. However, the original DT Swiss on my KTM road bike with the same tires were horrendous to put on, and these are all just clinchers! I noticed the DT Swiss on my BMC trackmachine were hard to mount as well, as well as my HED Tri-spoke track clincher....no rhyme or reason to it. I’ve got an issue with standing starts where my rear wheel is bouncing up and skipping as I drive over the first half lap. Looking for ideas for reasons why. I know without video it’s hard to give exacts so looking for general ideas. One suggestion was tyre pressure as I’m running at the maximum of the tubs (215psi) which is probably excessive. I had difficulty fitting Conti 4000 II tires on my Shimano Ultegra wheels (they are now tubed/tubeless capable) and installing tires on a fleet of track bikes.. My LBS owner showed me how to install tires, using a technique similar to how tubulars are installed, and I've never had a problem since. Also I use Vittoria ultralite inner tubes on my own bikes because when slightly inflated it has a small diameter. Update: I searched YouTube and found this video - the first hint is basically the technique I described above. Last edited by 700wheel; 02-17-18 at 02:54 PM. Without seeing you, the first thing that comes to mind is that you are leaning too far forward up to or over the front wheel. I had this issue when I was riding a 57cm frame. I now ride a 61cm. I'm not suggesting that you need a new frame. Just saying that my problem started with a too-small frame. I also immediately wondered if your bars might be too low. This has happened to me in the past as well. Are you straight arming your starts and staying over the seat for the first few strokes? I think specifications for tubeless might be different than older tires, but I don't think tires have changed much from the ETRTO standards of years ago. the tight tires you may have experienced may have drifted toward the tight end of the spectrum as the wheel is at the high end of the spectrum as well, leading to a tight fitting pair. That said after 12 years in a bike shop I rarely meet a tire I can't get on a wheel by hand. Thanks, Nate! I've never heard of ETRTO until this post. I searched and found a bit of information. So, how do you deal with, say, new Conti GP4000 or a Conti Trainer Tire? Any special tricks? or just brute force with super thumbs? Contis and WTBs are almost always tight. The more of the bead you can get in to the rim channel the better they'll go over the rim. It won't be easy, though. 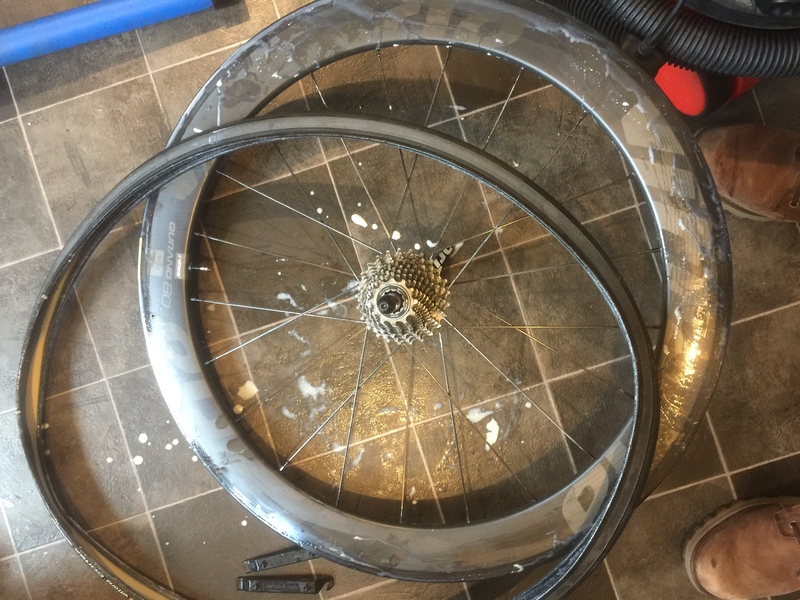 Gluing Conti tubs are the WORST. Don't use your thumbs, use the ridge of the pads of your knuckles to roll the tire on. For me it is like rolling my fingers into a fist around the tire. i use that ridge to grip the tire and roll the tire on. All of the above only works if you get one bead on, and make sure the tube (slightly inflated) is centered over the rim, not half in half out. When you go to put the second bead on you have to start at the valve and work away from the valve. The valve area is the tightest area on the wheel. A couple of years ago I built a set of clincher training wheels and had some unsettling experiences with them. When I would turn hard on the track it would feel like the tire was rolling off the rim. I switched back to tubulars and haven't looked back. I've only felt that feeling when using a set of tubulars that had been in used for a lot of miles. I could push the tires over and see the base tape staying down on the rim but the tire would move some. It was a an almost-fishtail type feeling when diving into a turn. - Velocity Deep-V tubular rim. - Conti Sprinter tires that were on their 2nd season. Same feeling! I had an issue with the base tape coming off of a conti sprinter on my rear disc at the last pro race of the year at DLV. Felt weird taking 3,4 at 35ish mph so I inspected it. Noticed the problem and removed from the bike immediately.